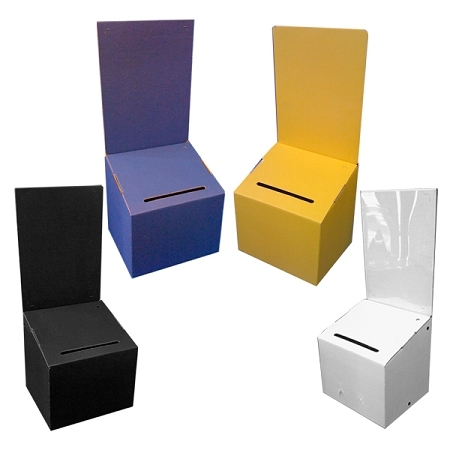 These are our most popular ballot box style used by Health and Fitness gyms, Martial Art studios, Spas, Chiropractors, etc.. Well balanced blue, black, white or yellow cardboard suggestion box with a slanted top made from strong corrugated cardboard. It provides maximum visibility using the least amount of counter space and easy to set up. 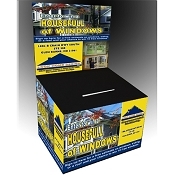 This comment box is designed to be opened and closed and unlimited amount of times without damaging or putting unwanted creases on the box. 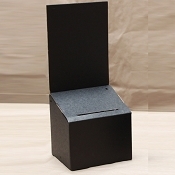 This box allows you to place an entry pad on the top without covering the drop slot. This style comes in other colors; yellow, black, and white. Flat finish. Please note if color for box is not selected, we will automatically ship you the black cardboard entry box. Artwork, entry pad, pen are sold separately. Header Size: 5.75 wide x 7.75" tall. Footer Size: 5.75" wide x 4.25" tall.